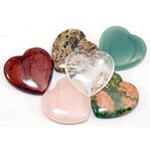 Cute, mini heart shaped clear quartz stones. Our clear counter top displays are an economical way to display these quick sellers. These are an ideal wedding favour!